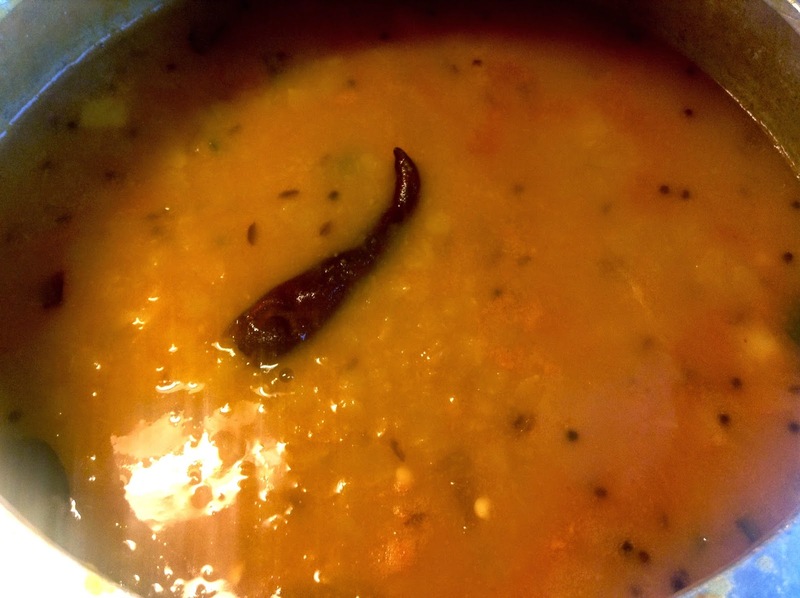 My soul-food, a very simple dal tadka with abundance of garlic, cooked in mild spices and served with Jeera Rice.. this recipe comes from my mother's kitchen. Wash and boil the dal with a little salt and turmeric powder. Cook for 7-8 whistles until the dal is soft. Remove from heat and let the pressure escape. Heat 2 tsp. oil and add cumin seeds and asafoetida. Add chopped onions after a minute. Fry until the onions start browning. Add half the garlic and fry for another minute. Add ginger and green chilli. Add salt, red chilli powder and turmeric powder. Mix well and let cook until the tomatoes are soft and the masala starts leaving oil on the sides. Mix this masala with the dal and let the dal boil for another 5 minutes. Prepare the tempering: heat 1 tsp. oil and add the remaining garlic and cook well until it starts becoming brown and cooked. Add mustard seeds, curry leaves and red chilli. Temper for 30 seconds and add to the dal. Mix and remove from heat after 30 seconds. Add the garam masala and kasoori merthi. Without mixing, cover with its lid. After 10 minutes, remove lid, mix well and serve hot.